Huawei was very busy today, unveiling 3 new laptops. There’s the MateBook E as a high midrange 2 in 1 offering, then the MateBook X Pro as a sort of flagship, plus the Huawei MateBook 14, as a 2K notebook for mainstream users. Let’s check it out. 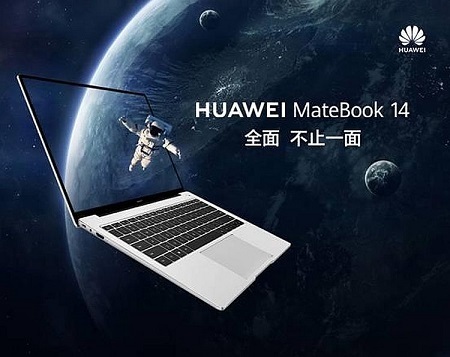 MateBook 14 follows in the footsteps of the MateBook 13, that came in 2018 with a 13-inch screen. The newcomer opts for a 14-inch screen with a 2160 x 1440 pixel resolution and wide color gamut. The screen contrast is 1000:1 and the brightness is around 300 nits. The left and right borders are merely 4.9 mm thick and the display ratio is 90% on paper. There’s also a concealed camera design, that only appears when needed. On the hardware front, we find inside the Intel Core i7 CPU, 8th gen, and NVIDIA MX250 graphics together with it. On the storage front, there’s a highspeed solid stage drive and for cooling, we have a shark fin fan 2.0, with a fan blade that uses a shark fin design and offers up to 18% higher air volume than a regular fan. Huawei MateBook 14 has a large capacity 57.4 Wh battery and users special power saving features, that allow it to reach 15 hours of Full HD video playback or 14 hours of Office operation. There’s also a 65 W charger bundled and after 15 minutes of charging you get 3 hours of Office use. On the connectivity front, there’s USB Type-C, HDMI, audio jack, USB 3.0 and 2.0.